I recently went to the allergist to find out exactly what shellfish I had to stay away from, and I got easily some of the best news of my life: I can eat anything but shrimp, lobster and crab. Since I’ve never had anything but shrimp, I’m on a mission to try it all. So far, I think I’m doing pretty well. I started out with all the oysters I could manage on a trip to New Orleans, and I am experimenting with scallops at home, but I’ve always been captivated by mussels. There’s something about an intoxicating broth, a large hunk of bread, and bite-sized mussels. Now that I’ve had them, not only am I hooked but I’m trying to make up for lost time. In a cold pan, add the garlic, red pepper flakes, and oil in a deep 12-inch heavy skillet. Put the pan over moderate heat, stirring, until fragrant but not browned, about 3 minutes. Add tomatoes with purée, tomato paste, herbs, capers, olives, and wine and simmer, uncovered, stirring occasionally and breaking up tomatoes, until sauce is thick, about 15 minutes. Don’t salt the sauce. I know that you’re tempted (was too) but there’s plenty of salt in the capers and olives. As it cooks, the sauce will get very thick – that’s what you want because the liquid from the mussels will thin it back out. Cook the linguine in boiling salted water until al dente, then drain in a colander. While the pasta cooks, increase heat under the sauce to moderately high and add mussels, then cook, covered, until mussels just open wide, checking frequently after 3 minutes and transferring to a bowl. (Discard any mussels that remain unopened after 6 minutes.) All of my mussels opened after 3 minutes and were perfectly cooked. 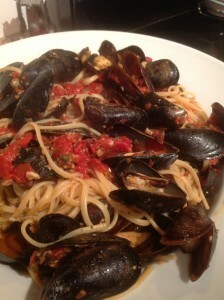 Serve linguine with mussels and sauce. If you’re not in the mood for pasta, this is amazing on its own. Just pour the mussels and sauce into a large serving bowl along with a crusty loaf of bread. · Just before cooking, clean mussels by scrubbing them well with a brush under cold water and scraping off any barnacles with a knife. If beard is still attached, remove it by pulling it from tip to hinge or by pulling and cutting it off with knife. We got out mussels from Empire Fish in Wauwatosa because we were out that way, which is great. If you’re in Milwaukee, I also suggest St. Paul Fish at the Milwaukee Public Market. · Tomato sauce, without mussels, can be made 2 days ahead and chilled, covered.